Some coffee grounds here, some eggshells there, and the next thing you know, the landfill is full. All 130 acres at maximum capacity. So how do you top that? 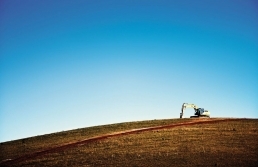 In the case of the I-95 Municipal Landfill in Fairfax County, Virginia, it was a carefully engineered capping system. To maximize the long-term environmental safety of the landfill, a geomembrane cover was installed to prevent rainwater from leaching through and contaminating the groundwater below. The cap system started with a layer of very low-density polyethylene liner, textured to prevent slippage of a covering layer of topsoil. Much of the soil was recycled from the excavation of the nearby Washington Metrorail station. Normally unusable screenings were recycled from a nearby quarry and incorporated into the drainage system. The soil was then seeded and fertilized with composted sewage sludge. The end result is a lush, green, fertile landscape. Now if only they could do something about the I-95 traffic, too.